Is Gionee's four-eyed camera phone as good as it seems? Having a camera on your smartphone isn’t much of a luxury anymore. Even dual lens systems are becoming less novel by the day. But what if your phone had four cameras? This very phone exists in the form of the Gionee S10, which will release in China soon. It will have two cameras (20MP + 8MP) on its front and two (16MP + 8MP) on its back. Additionally, other highlights on the S10 include the Mediatek Helio P25, 6GB of RAM and a 3,450mAh battery. You might be asking, “why four cameras?” Other than the “why not?” mentality that’s easy to cling to when it comes to seemingly superfluous hardware features, this whole four camera thing could catch on. No, four cameras won’t let you take four times the amount of photos or let you see into the future. Actually, we’re unsure about that last part. But based on how we’ve seen other phones with a duo of lenses behave, Gionee’s is likely to do the same. That is, it will take relatively standard-looking photos, but with more depth of field, further enhancing the “DSLR-like” look that’s slowly but surely seeping into the mobile world. But let’s get this straight: the Gionee isn’t the first four-camera smartphone. The Lenovo Phab 2 Pro takes the award for that. However, that phone’s aim is very different than Gionee’s seems to be. Lenovo’s smartphone has three cameras on its back because of its Tango AR implementation. Only one of the sensors was a traditional snapper and it shared space on the phone’s back with a motion camera and depth camera. Combine the efforts of all three simultaneously and you can do much more than just take a picture. You can place life-size dinosaurs or a piece of furniture in your living room with a single tap with its augmented reality powers. As the Phab 2 Pro shows, a four lens camera can be used for much more than just standard imaging. Phones with dual cameras are here to stay or at least, it seems that way. 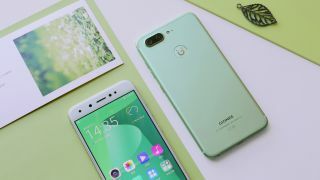 They have found their way into the iPhone 7 Plus, LG V20 and LG G6, among others, so Gionee’s move here tries to one-up the competition with a numbers game rather than stir up hopes that it will bring about the next big innovation in imaging. There’s a good chance that Gionee’s selfie game with the S10 will be among the few to beat thanks to its dual lenses. And although this phone isn't yet coming to regions outside of China, we'd really like to put its cameras to the test. But, given the increasing variety of things you can do with multiple cameras on a phone, as Lenovo’s AR phone has shown, bragging about what you can do with your lenses is more important than simply touting the number of lenses your phone has.